One of my fondest childhood memories was watching old, black-and-white reruns of The Twilight Zone with my dad. I’ve returned the favor by streaming select episodes for my kids to watch with me. 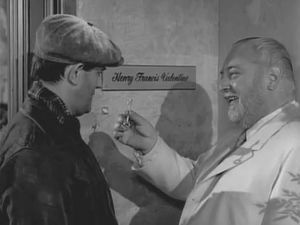 Our latest episode was,”A Nice Place to Visit,” featuring Henry Francis Valentine, a small-time criminal who’s killed during a robbery and wakes up in a place he assumes to be heaven, and where his every wish is granted by Pip, his guide. He asks for one million dollars and there it is in the desk drawer. He asks for new clothes and instantly he has a custom wardrobe, sized perfectly. He asks for beautiful women and there’s a knock on the front door and three gorgeous women appear and fawn over him. The criminal loves to gamble, so off they go to a casino where he wins every round at the roulette table, he hits the jackpot with every coin he puts in the slot machine and his every break-shot in billiards knocks all the balls in the pocket. Rocky, as he calls himself, quickly gets bored of winning every game, having his every whim satisfied and spending an eternity with only Pip and himself, the only real beings in the place. Finally, Rocky says he’s tired of heaven and he wants to go “to the other place,” to which Pip replies, “This IS the other place,” while laughing maniacally. My daughters got it, they understood how torturous it would be to literally, immediately get everything they want, without effort, challenge or the possibility of failure. They intuitively comprehend that striving, earning, is what gives your rewards meaning and makes achievements fulfilling. A Black Belt has meaning because of the years of effort put into it, the sacrifices made, and the wisdom gained; the true value lies in what a Black Belt “means,” the value lies in beinga Black Belt vs. havingone. Somewhere that gives you instant gratification might be a nice place to visit, but you wouldn’t want to live there. We Survived the Bomb Cyclone. SMAA is Open. What’s With All the Weird Names?